After reaching his first ATP Tour final in almost a year, Novak Djokovic still appeared far from content. The 12-time Grand Slam champion set up a meeting with Marin Cilic by defeating Jeremy Chardy 7-6 (5), 6-4 at Queen's Club on Saturday. 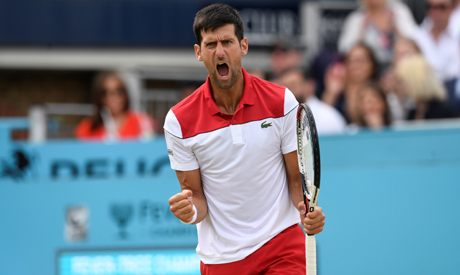 Djokovic's last final - and title - also came on a British grass court when he defeated Gael Monfils in Eastbourne last July. ''I'm just self-critical, I guess, at times,'' Djokovic said. ''I maybe don't show the satisfaction or exhilaration when maybe it's expected or vice versa, or other emotions. The in-form Chardy had won 12 of his previous 13 matches but the Frenchman was still left without a win - or even a set - against Djokovic after their 11th career meeting. The Serb, who has struggled this season after missing the second half of 2017 with an elbow injury, upped his level in the second set to force break points in three consecutive Chardy service games. The Frenchman resolutely denied Djokovic at 2-2 and 3-3 before the three-time Wimbledon champion finally broke through with some of his best groundstrokes of the match to take a 5-4 lead. Cilic booked his place in a second successive Queen's Club final by edging Nick Kyrgios 7-6 (3), 7-6 (4). The top seed raised his game when it mattered most, winning both tiebreakers against the Australian in a match which featured no breaks of serve. Cilic, who was the runner-up at Wimbledon last year and at the Australian Open this season, will be playing his fourth Queen's Club final. He won the Wimbledon warm-up event in 2012 but has since lost finals in 2013 and 2017. Despite the Croat's grass-court prowess and superior recent Grand Slam form, the fact that he's down 14-1 against Djokovic on head to head ensures Cilic won't be feeling superior. ''I watched here and there some of his matches,'' Cilic said. ''He's playing well. He's starting to play better.